It's already a groundbreaking phone and digital music player, and now Apple's iPhone is emerging as a popular gaming device as well. Of the 1,300 add-on programs currently available for it, about a quarter are games — as are seven of the 10 most popular selections in the Apple App Store, which opened on July 11. If you had any doubts as to the viability of Apple's iPhone as a gaming platform, Sega has some numbers that might help change your mind. 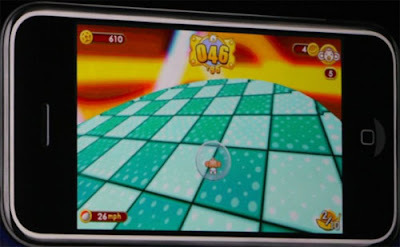 In the 20 days following Super Monkey Ball's launch on the new iPhone App Store, Sega reports over 300,000 copies of the game have been purchased. Purchased, mind you - you don't get shipping numbers on iPhone apps. That's nearly $3 million in revenue!! Not bad for a platform that has only been in a market for such short period of time. That kind of demand, along with plans for more and better offerings, could launch the iPhone into a whole new stratosphere of mobile gaming. Part of the reason mobile phone gaming hasn't caught on yet is that the games tend to be simplistic or crippled versions of games made for PCs or the Xbox 360 and PlayStation 3. You find a lot of repeated titles. The gaming experience is poor, and it's hard to discover the games. But the iPhone's entry is going to change the mobile gaming landscape. Key to the iPhone's success as a gaming platform is a deep portfolio of titles that take advantage of the device's coolest attributes, such as its tilt sensor. The most popular application in the entire App Store today is the free maze game Labyrinth, created by Illusion Labs in Sweden, in part because it responds satisfyingly to even the slightest hand movement as players direct a virtual ball through various mazes. Another sought out game, Sega's $9.99 Super Monkey Ball, which i had mentioned earlier — players tilt the device to navigate a series of increasingly precarious platforms. But can a mobile phone ever really compete with dedicated handhelds like the Nintendo DS and PSP? Some argued that why buy two separate devices when you can have all-in-one device. The iPhone is a powerful and excellent hardware which maybe able to host both but it remains to be seen. The Apple store is a great channel to host the games and i dont reckon PSP or DS can top that as both of which are still relying on physical cartridges. Why Geisha walks with small steps? The Onion: The Beijing Olympics: Are they a trap?